It is quite normal for women to feel breast pain at some point. Breast pain is medically known as mastalgia. The pain can be described in different ways and can have several causes. Let’s take a look at what some of these might be as well as what you can do to prevent breast pain. Breast pain usually affects pre-menopausal women. There are three major types of breast pain which are categorized on the basis of the type of pain, the age of the women who are affected by it, and where in the breast/breasts the pain occurs. Most women will experience cyclic breast pain. This kind of breast pain will occur in the entire breast rather than being isolated to a particular area of the breast. Pain will occur in both breasts. Pain is characterized by tenderness and a feeling of heavy fullness in both breasts. You may also feel like your breasts are a little lumpy. Affects women between the ages of 20 and 50. Pain is usually in just one breast and that too in just a particular area of that breast. With non-cyclic breast pain, there may be a burning feeling in the breasts or a kind of soreness which is similar to an injury. Affects women in their late forties and into their fifties. Both cyclic and non-cyclic breast pain are localised to the breast. There is another kind of breast pain classified as extra-mammary which feels like it is in the breast but which is actually pain from a nearby muscle or organ which is radiating to the breasts. Breast pain may be felt in just one breast or in both. It may be intermittent, i.e., occurring on and off in no set pattern, or it may be constant. It can last anywhere from a few days to many months. The severity will obviously differ from woman to woman depending on several factors such as psychological state and cause of the breast pain. The breast or breasts may feel very heavy. Another symptom of breast pain is breast tenderness. Even just touching your breasts can make them uncomfortable. A burning sensation may be experienced. You may feel tightness in the breasts. When doing a self-breast examination, you may feel lumps that were not there before. Do not be alarmed. This does not necessarily point to breast cancer. Breast tissue can get thick and feel like a lump for many reasons that have nothing to do with cancer. When you think of breast pain, your first thought is to link it to breast cancer. However, rest assured that this is nowhere near one of the top causes for breast pain. Here are some of the more common causes of breast pain, most of them actually quite harmless as you will see. You may experience breast pain a few days before your period. This is a result of hormonal changes that occur in your body during your menstrual cycle. This is the most common cause of breast pain and is nothing to worry about. The pain will go away of its own accord in some days. Know that your body tends to retain water during your periods (which is where that bloating sensation comes from) and this may also lead to breast pain. Hormonal changes during pregnancy and while breastfeeding your baby can also cause breast pain. Here too there is no cause for worry but you should speak to your doctor about it if the pain is unbearable. Hormonal changes brought about by contraceptive pills/injections and even infertility treatments have been known to cause breast pain. Post-menopausal women who are using HRT (hormone replacement therapy) to deal with menopause symptoms may also experience breast pain. This is one of the very rare instances when breast pain affects post-menopausal women. Women who have naturally large breasts or who undergo breast enlargement surgery to enhance their breast size may experience breast pain simply because of the size of their breasts. Very large breasts can also explain pain in the neck, back and shoulders. If you recently suffered an injury to your breast, there may be bruising or tissue damage which can cause breast pain. You may already know that the body requires a perfect balance of proteins, fats, carbs, minerals, hormones and a million other little things to function optimally. Even a slight imbalance causes problems. In regards to breast pain, an imbalance of fatty acids can increase your breast’s sensitivity to regular hormonal changes. Stress can cause breast pain, and this is the hardest cause to diagnose. Breast surgery sometimes leads to a lingering pain in the breasts even months after the procedure. Breast enlargement or reduction surgery, biopsies, or surgery for cancer-removal may all result in breast pain either right after surgery or much, much later. In some cases, breast pain can be caused by an infection in the breast. 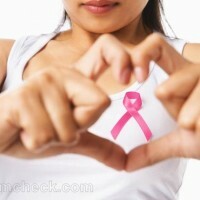 In very, very rare cases, breast pain may be linked to breast cancer. But this is a very remote possibility so don’t panic yourself into a frenzy if you experience breast pain. Since most breast pain is caused by hormonal changes during the menstrual cycle, there is often no need for any treatment at all. Observe your breast pain for some time and you will see for yourself that it occurs at a particular time during or before your period, and that it goes away on its own within three to five days. If it lasts for more than a week, see your doctor. If breast pain lasts for a really long time or it is so bad that you cannot focus on your work, see your doctor. Breast pain caused by hormonal medication like HRT, infertility treatments and contraceptives will stop when you stop taking the medication in question or when you alter the dosage. You will need to have a discussion with your doctor to decide what to do in this case. If you experience breast pain post-surgery, see your surgeon. There may be complications that need medical attention. There are topical creams for breast pain but these are rarely ever prescribed. There are also medications for breast pain but they have side effects which are not worth the risk which is why doctors prefer to treat the cause of the breast pain rather than the breast pain itself. Reduce your intake of salt. The more salt you consume, the more water your body retains. As we have already seen, water retention is one of the causes of breast pain. You will notice when you cut down on salt that even breast pain occurring during your menstrual cycle is greatly reduced or even eliminated. Cut down on your caffeine intake too. Several women have found relief from breast pain when they keep away from caffeine or reduce their intake. Wear a good sports bra which gives you enough support at all times, especially when you exercise. They should be protected against the jarring movements that are bound to occur during cardiovascular physical activity. The more stressed you are the more sensitive your body will be to pain. Try meditation, yoga or just find more time to indulge in relaxing hobbies to reduce your stress and anxiety which will in turn help to reduce your breast pain. Taking vitamin E and evening primrose oil has been shown to bring some relief from breast pain. Researchers are unsure why the vitamin E helps, but they hypothesise that the primrose oil balances fatty acid levels and thus regulates your sensitivity to hormonal changes.